The Atlanta Braves will not be playing their entire 2019 Spring Training season in Sarasota County after all, the team announced on Jan. 31. 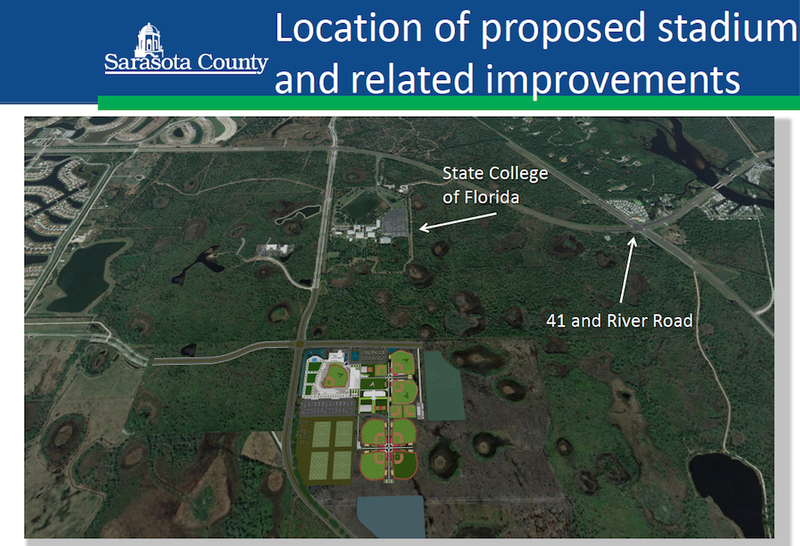 Because of normal issues related to construction, their stadium complex in the West Villages near North Port will not be completed in time for the start of Spring Training next year, Jeff Maultsby, director of business and economic development for Sarasota County, told The Sarasota News Leader in a Feb. 1 telephone interview. “There’s one opportunity to get this thing right the first time,” he said of the construction, and that is the Braves’ focus. “You want to make sure the entire facility is completed,” Beth Marshall, senior director of public relations for the Braves, said in a separate telephone interview with the News Leader on Feb. 1. The team and Sarasota County and City of North Port leaders always knew the possibility existed that the complex might not be finished in time for the full 2019 Spring Training season to take place in the West Villages, Marshall added. “It was just a really short timeline,” she added of the construction schedule. The groundbreaking for the facilities just took place in late October 2017, Sondra Guffey, marketing manager for the West Villages, pointed out in a Feb. 1 telephone interview with the News Leader. She concurred with Marshall that the team “had a very aggressive schedule” to be able to relocate in time for all of Spring Training next year. However, the Braves did note in their Jan. 31 news release that they will play their final 2019 Spring Training game at the new ballpark. In the meantime, the Braves have extended their Spring Training agreement with ESPN Wide World of Sports at Walt Disney World Resort through April,2019, the press release noted. “We are thankful for our good friends at Walt Disney World Resort and are excited for this extension,” said John Schuerholz, Atlanta Braves vice chairman emeritus, in the release. The decision to pursue the extension “will take the stress out of all of it and give us a little breathing room,” Marshall told the News Leader, eliminating any potential for “last-minute plans” in the event the North Port facilities would not be ready. “We’ll do something fun with that final home game [in 2019],” she noted. Guffey and Marshall both pointed out that from April 2019 on, the complex is “going to be an active and busy place,” as Guffey put it. 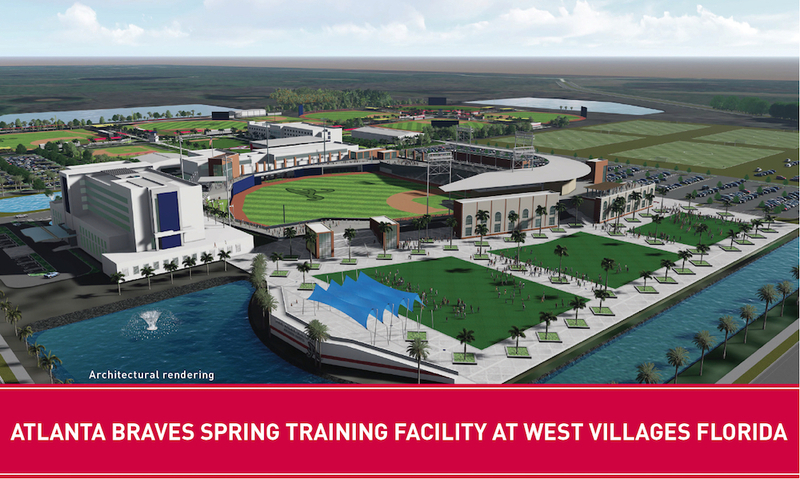 The complex will operate year-round with extended Spring Training for minor league teams, the Gulf Coast League and the Fall Instructional League, the Braves’ press release noted. The Braves have held their Spring Training at Champion Stadium at ESPN Wide World of Sports Complex in Lake Buena Vista since 1998. When completed, the new ballpark in North Port will feature 6,500 fixed seats and room for 2,500 more people in general admission areas, including a berm and concourse, the release pointed out. 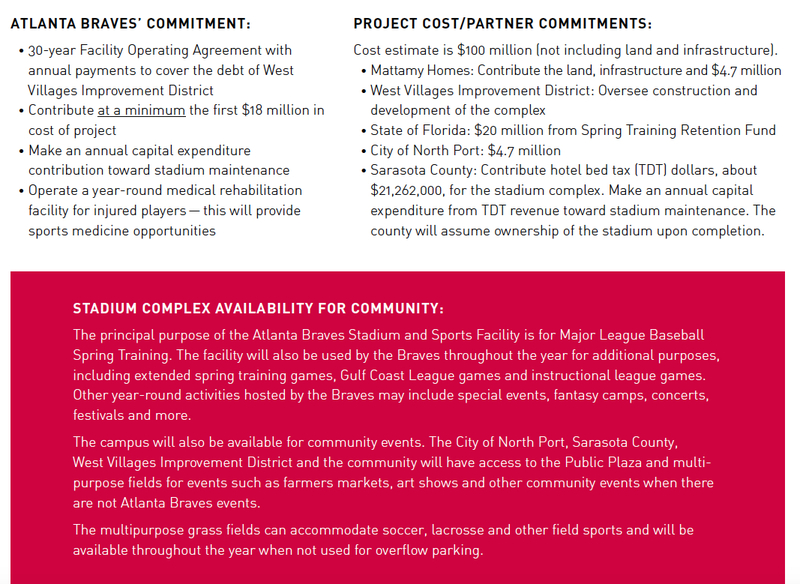 The overall facility will include six-and-a-half practice fields, plus 55,000 square feet encompassing a clubhouse and fitness center for the Braves, along with multi-purpose fields and public space that can be used for special events by the City of North Port and Sarasota County, the release said. A Sept. 19, 2017 North Port City Commission vote marked the final step in the process of approving the necessary agreements to make the Braves’ relocation a reality. The Sarasota County Commission took its final vote on the documents on Sept. 13, 2017. “This has been a long time coming,” County Commissioner Alan Maio said at the time. On March 8, 2016, the County Commission formally authorized then-County Administrator Tom Harmer to continue negotiating with the Atlanta Braves and the West Villages for the design and construction of the facility. Having a Major League Baseball presence in South County “would further Sarasota County’s reputation as a sports tourism destination,” Maultsby, the county’s director of business and economic development, said in a news release the county issued after that vote. The Baltimore Orioles conduct Spring Training at Ed Smith Stadium in Sarasota. “We’re real excited,” Marshall said of the Braves’ relocation to North Port. “There’s a lot of Braves fans [in the area],” Guffey added, and they eagerly anticipate the move.